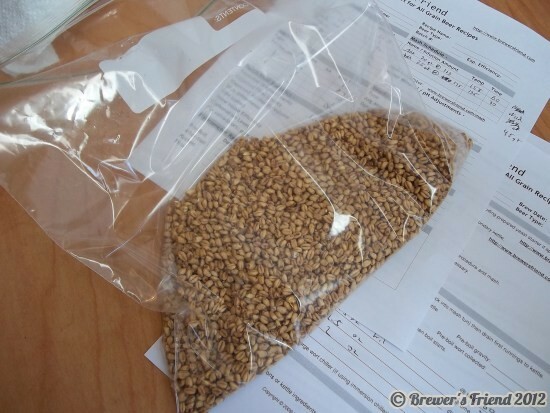 Wheat malt takes extra preparation in brewing since it is smaller in size than standard malts. The first time I ran wheat malt through my grain mill, it was frustrating to discover the gap was set too wide for the wheat malt only! The other grains were being crushed perfectly. I ended up trying a few different approaches until I was successful. My mill is not easy to adjust, so adjusting the gap only makes sense for me if I am going to do a lot of it. 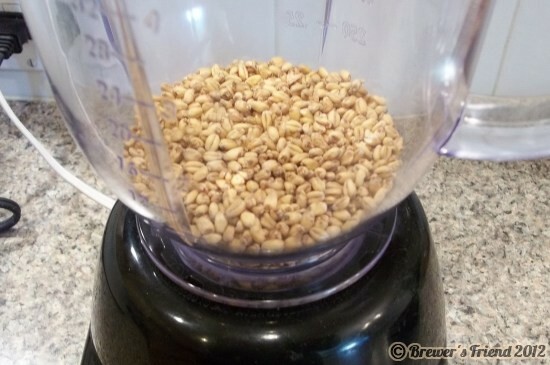 For crushing small amounts of wheat malt, the best approach I found is to use a blender. To make this more confusing, there are several types of Wheat Malts: white wheat, read wheat, pale wheat, carawheat, chocolate wheat, etc. Rye malts are even smaller than wheat malts. 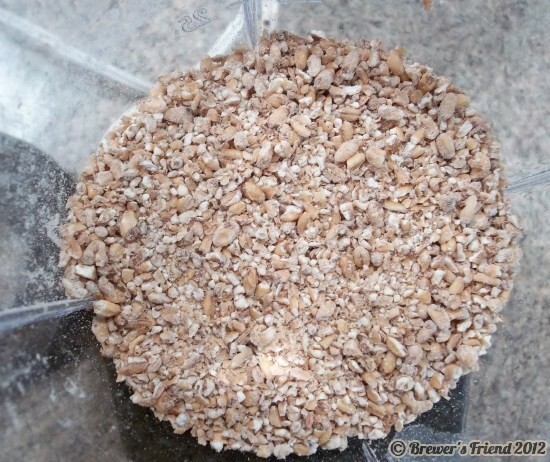 Be prepared to adjust the gap on your mill when using Rye or Wheat malt, or resort to the blender. This was a lot of work but it got the job done for the most part. This is really only feasible for a half pound of wheat malt or less. The plastic bag is ruined and you need a nice smooth concrete slab to hammer against. The floor of my brew shed worked well, but this took a good 10 minutes to complete. You can still see a few whole kernels in this picture. The bag is completely shot. Many small holes develop as part of the pulverization process. This is completely out. I could not get enough pressure on the kernels to break them. Gave up after a minute. Great if your mill is easy to adjust and you can reliably adjust the gap back to the correct setting for standard malts. This is only viable for me if I am doing more than a couple pounds. Next time I make a Hefe, which requires 60% Wheat Malt, this is the option I will use. Some people have reported they run the wheat malt through their mill twice. In my case this did not help at all. Way too much of the wheat malt was falling through without being crushed. This is the winner! The blender is a cheap-o no name brand, with a weak motor and a dull blade. In other words, a fancy blender is not needed to mill wheat malt. My approach is to crush 1-2 cups of wheat malt at a time. Adding just a touch of water really helps. Without water the kernels tend to bounce around too much. Some of the very fine flour got stuck in the bottom of the blender. In the final image below, a few kernels are left whole, but everything underneath it has been nicely ground and is ready to go into the mash. A protein rest is recommended when brewing with Wheat Malt (~120F for 20 minutes), but not required. 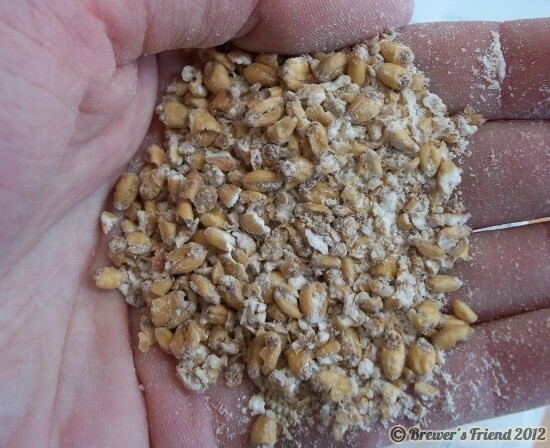 If the grain bill has more than 25% Wheat Malt, it would be a good idea to add rice hulls to help prevent a stuck mash. When Wheat Malt is mashed it globs up and looks like oatmeal. Wheat malt is traditional used in beers like Hefeweizen, Bavarian Weisse, Wizens, where it makes up 40-60% of the grain bill. 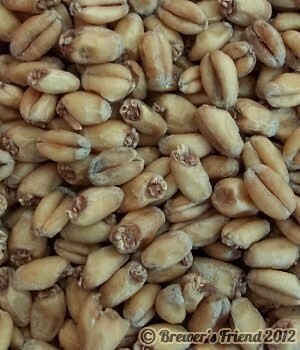 Wheat malt can also be used in extract brewing as a steeping grain. Increasing, a small percentage (3-5%) of wheat malt is added to grain bills of all types of beer to aid in head retention and body. I have been experimenting with this myself. 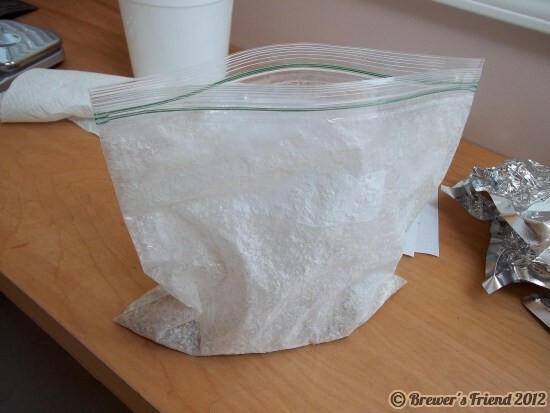 When I did grain/extract brewing and wanted to crack grain for steeping, I used a wine bottle instead of a rolling pin, and I had a slab of iron plate for a rolling surface. This worked fine. An added advantage was that I had to have an empty wine bottle on hand somehow. A coffee bean grinder also works well.